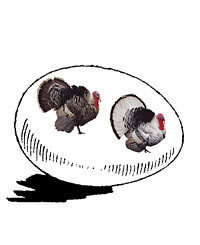 Our Turkey Egg Assortment includes a minimum of 2 heritage breeds of the turkeys that we sell. This excludes the Broadbreasted Bronze and Giant White. These eggs are sold in lots of 12. Shipped USPS Priority Mail. Available from April through June. We ship all eggs insured report any losses to post office immediately upon arrival. These eggs will arrive within 11 days after the delivery date you select during the checkout process. We guarantee a minimum of 2 breeds - hatchery choice. Can I order for just one breed of turkeys or do I get a mixture of all of the breeds that you raise? The turkey eggs are sold in an assortment only. Your not able to choose specific breeds. I am interested in raising a few turkeys. This will be my first experience. Other than the wild turkey, which of the turkey breeds that you sell, will fly and would have to have their wings clipped and which ones will not fly? The only breeds that will definitely fly are the Eastern and Rio Grande wild turkeys, and possibly the Narragansett. All the other varieties are more domesticated and typically do not fly. The price comes out to be $5.84 per egg.